Just how connected are the Jews, genetically speaking? Despite the fact that pockets of Jewish people are spread around the globe, the new genetic analysis by Harry Ostrer and his team says that they share genetic markers that go back thousands of years. Historians divide the world’s 13 million living Jews into three groups: Middle Eastern, or Oriental, Jews; Sephardic Jews from Spain and Portugal; and Ashkenazi Jews from Europe [ScienceNOW]. Taking nuclear DNA samples from 237 Jews—some from each group—the team compared them to samples from more than 400 non-Jewish people who lived in the same regions. The authors found that not only did the Jewish group as a whole constitute a distinct population cluster, but that one by one each of the three Diaspora subgroups themselves also represented a distinct cluster within the larger Jewish group. They further noted that the two largest subgroups — Middle Eastern Jews and European Jews — were found to have split off from one another about 2,500 years back [BusinessWeek]. Within the Jewish subgroups, the study found, people are about as closely related as fourth or fifth cousins. That isn’t a surprise, but the analysis clears up some of the origin stories of different Jewish peoples. That’s especially the case regarding the Ashkenazi, who account for the vast majority of Jews living in the United States. Some writers, notably Arthur Koestler in his 1976 book The Thirteenth Tribe, have argued that the Ashkenazis stem from a Turkic tribe in Central Asia called the Khazars, who converted to Judaism in the 8th century. And historian Shlomo Sand of Tel Aviv University in Israel argues in his book The Invention of the Jewish People, translated into English last year, that most modern Jews do not descend from the ancient Land of Israel but from groups that took on Jewish identities long afterward [ScienceNOW]. The relatedness is also a confirmation that history can show up in the genome—even specific events. Historical records suggest there were about 50,000 Ashkenazi Jews in 1400 and that the number expanded to 5 million by 1800, one of the largest population booms ever recorded, Ostrer says. That bottleneck and population explosion is also recorded in the DNA, his team found [Science News]. The populations that the samples were taken from are a minority within the Jewish population. This study is deeply flawed by selecting only certain segments of the Jewish population that are more likely to be related to the original Middle Eastern genome population. Just look at how many blue eyed, blonde haired Jews there are. They’re obviously not Middle Eastern. The modern day Jew is mostly of Euroean origin rather than Middle Eastern. Jewish people of Middle Eastern descent are now the minority. dreamhunk, is the study flawed because its findings contradicts with your personal views? The study included the three major types of Jews, including Ashkenazi Jews. Oh really? Can you name one famous blonde haired blue eyed Jew? How about the Jews in China? They looks very Chinese. What this article left out is that Jews are genetically identical to Palestinians, Syrians and Lebanese. Also the article left out that Tay Sachs is just as common in the French in Canada and the Cajuns in the United States. I doubt the comment box will allow me to post sources but legitimate science websites can be found with a quick Google search that confirm this. also where is lembra tribe and Ethiopian Hebrews in this picture? Hey dreamhunk–go around saying “heil Hitler” much? To Dreamhunk: Please do not spread your multiple BS. Get a life! You’re mixing Jews with Arabs like yourself which are not Semites AT ALL with an exception of those who forcefully converted to Islam by the Arab savages since Mohammad’s genocidal conquest on a Hebrew City-State Medina which name was from Hebrew name “Medinat” which stands for a State. The official name of the resurrected from ashes Hebrew State on The Holy Land is Medinat Yisroel. The letter “T” in Medinat is not pronounced. Some genetically similar to Jews Arabs was born from Mohammad and his gang members by impregnating captured by fire and sword Jewish girls from Medina and other Hebrew towns in the Middle East. Arabs never belonged to Semites and never prior Mohammad’s conquest got any land or state and relationship to Jews and Abraham. Therefore, Quoran is a fraud. You did not like my links on racism towards blacks form” white Jews”! But it’s OK for people to call me Hitler. It’s good to know Ethiopian Jews are treated like dirt because of their skin color. There were no white people in the land in those days. I am sorry but it’s the truth. I gave just some of the list of reasons. It has nothing to do with hate it’s called facts and truth. Knowledge is the only cure for ignorance. People defending their position and calling them Hitler is a cheap shot and ignorance on their own. and to call Arabs savages? Sounds like the bile The Nazi’s themselves would spew about Jews being vermin. Ignorance and Racism is no defense to attack a person. This blog is for the purpose of debate. Not scurrying yourselves to put down people or act like a 5 year old bully in a play pen with too much to prove. If there’s any rebuttal to dremhunks’ statement (and opinion) do it with intelligence. Don’t let your own insecurity turn you into The Nazi’s and Arab Savages you hate. A group of people can lie about its origin but not about its language, and Yiddish language speaking by the Azkenazis is a slavo germanic language of no Semite origin. Also in this article of Dr Harry Ostrer there ‘s a link not only between Sepharad and Azkenazi but also to Italian.Apparently they share the same kind of genetic basic. So where does it stop at? Taking samples from 200 people out of 15 millions of jews is ”infinitesimal” and can not be a tool of modelisation. Otherwise by chain reaction and extrapolation all the mediteranean people are caucassian and this closes the debate. He took also samples from people from the middle east apparently. Well, most of the libanese and Syrians have turkish origin and this after 6 centuries of Ottoman presence over there. Although the Khazar are known also to be of Turkish origin. If the study would be made on a more wide level it can be a major point. 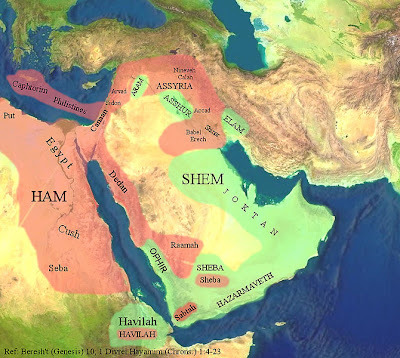 What about the Khazar origin as being from Ham, in the Bible. The canaanite were the first ethnic in Palestine also, and the Turks are from Ham as well. Last point, Medina original name was YATRIB built by the arabic tribe of beni Qar wa Qarn who converted to Judaism, nothing else, as about 5 major arabic tribes were Jewish by cnversion. The Arabs are Semite from Ihmael (The book of Jubilee). I have done much research or studying of the Hebrew language but people are saying that Hebrews has roots into Africa. Unfortunately, not one of you so called intelligent persons have probably read the original paper regarding the Cohanin Modal Haplotype (“CMH”) and obviously unable to comment on its strengths or limitations. Additionally, I have not seen any comments or references to any scientific studies that contradict the original findings. Like most, you heard something on the news or by some other medium, and you are simply repeating those sources without any independent verification on your part. I will not waste my time citing for you such resources, and they do exist, because most of you have made up your mind already. But try this at least, read the TORAH, it sets forth the true prophecies regarding the Children of Israel and their position in the latter and last days, and then compare the scriptures to those who say they are Israel seeds, and decide for yourself. The Children of Israel are of the seed Shem (EBER)then Abraham, Isaac, and Jacob. Ya knows his hidden ones and at that of their unveiling many faces will drop when they are revealed. The very people you call a no people, slaves, foresaken, and every byword known to man, are his people, and all nations have had a hand in violence against them, and will pay according to the TORAH. So laugh now while you can, however, the real Israel will be redeemed. Just wait a little longer and believe DNA will not be the litmus test. Julian condemns people for not backing up their statements with sources… and then he follows it up by presenting his archaic version of Mother Goose as being some kind of authoritative source. Well, I have a Spider Man comic here that says you’re full of it, you stupid, superstitious shmendrik. Shai: Scarlett Johansson, Lisa Kudrow, Elizabeth Berkley, Dani Behr, Evan Rachel Wood, Ashley Tisdale, Romola Garai, Paul Newman, Kate Hudson…and so on. You idiot. ah, the Tower of Babel rears its ugly head yet again. May I remind all you armchair experts that the first steps toward Wisdom are three words: I DON’T KNOW……. get a little freakin’ humility. dreamhunk, read josephus yourself. he gives an eyewitness description of Jesus Christ, a Jew from 2000 years ago, who had BLOND HAIR, fine features, was tall and wasn’t dark skinned. Jews and others in the Levant coast have always had some blond and red haired people although that is the minority coloring for them. Nice try. I am not buying it. To my knowledge it is not for sale. A colleague once told me that it dates from the fourth century but others claim it is just another handy forgery from the Renaissance period. Whatever the case, it seems to be making the rounds on some of the Christian websites of late, usually accompanied by a second “description of Jesus” letter of similar indefinite provenance. MadamX, your post is an outright lie. Not one historian believes that this “letter” is legitimate; they all agree that it’s a 4th century CE Christian forgery. And your claim that “Copies are in the Congressional Library in Washington, D.C.” is the clincher (there’s no such body; there IS, however, a “Library of Congress”). ” Just look at how many blue eyed, blonde haired Jews there are. ” I am blond with blue eyes but still have Middle Eastern Jewish admixture and so? Do you understand Mr Obama had a white mother but he is called “black”? The point is: the looks are deceiving. Look in the genes. To survive holocaust meant to look like the natives. Jews did intermarry. But there is still Middle Eastern blood in them if they have Jewish ancestry, even with blond hair. I can see it on Gedmatch.com admix pages with my own genome and noone can tell it by looking at me. You need to understand how traits are inherited. I do not digest lactose. I have ‘Ashkenazi’ risks for certain diseases. My paternal line is not European but from the ME. But noone can tell this by looking at me and sensing my DNA with the nose.